New Yorkers enjoy the view from the Highline Park on the West side of Manhattan. The Internet company, which has offices in the Chelsea Market, has donated $1 million to the High Line park. 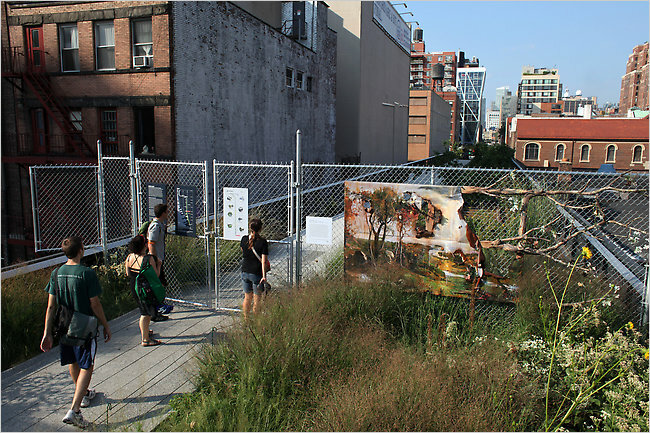 Robert Hammond, co-founder and President of Friends of the High Line, said: "We are grateful to Google. It's wonderful to have a business in the neighborhood contribute to something so many people enjoy." A fence marks the current end of High Line Park, which will eventually be extended north to 34th Street. When construction loans grew scarce two years ago, property development along Manhattan’s High Line, which had been fast and fierce, stumbled. One prominent project that still seemed to be moving along was a new branch of the Whitney Museum of American Art at the southern tip of the elevated park. While planning for that six-story museum at Washington and Gansevoort Streets is well under way, there are also signs that other development is picking up in this real estate submarket viewed as robust relative to some other Manhattan neighborhoods. The first part of the High Line, a landscaped city park created on abandoned elevated rail tracks that eventually is to stretch from Gansevoort Street to 34th Street, opened in June 2009, running north from Gansevoort to 20th Street. The second of three segments is expected to open in spring of 2011 and extend the High Line to 30th Street. Now, among the dozens of projects planned along the length of the High Line, some have changed hands and a few were sold by banks after developers defaulted, but most are still on track for development. Some developers are waiting for construction loans to become available, and other longtime property owners are just waiting for the right moment to move forward, but all agree that a submarket has been created, the strength of which could not have been envisioned just five years ago. Real estate owners along the first High Line segment, a large chunk of which spans the meatpacking district, said they were already starting to feel the park’s positive effects on real estate values. “For those who thought that area was a flash in the pan, something that already happened, they’re going to be pleasantly surprised with the next dimensions of the change in that neighborhood,” said Joseph J. Sitt, the chief executive of Thor Equities, a real estate development company that owns 446 West 14th Street, which connects directly to the High Line. Mr. Sitt said Thor was rebuilding 446 West 14th Street and would install a women’s clothing boutique, called Kritzia, by the fall, as well as a restaurant and a club lounge with a possible rooftop space by the spring of 2011. Hampshire Real Estate Companies of Morristown, N.J., has owned a warehouse at 259 10th Avenue between 25th and 26th Streets for many years. The company is prepared to overhaul the interior of the hulking structure, which was designed by the architect Cass Gilbert, but is waiting for the right tenant. “It couldn’t be better located,” said A. Eugene Kohn, chairman of Kohn Pedersen Fox Associates, the architecture firm hired to retrofit the building. Other longtime property owners were poised to develop when the recession hit. Edison Properties of Newark had planned two towers with 869 condominium apartments on a block west of the High Line between 17th and 18th Streets. The land is still a parking lot. Now, Edison executives are biding their time as they prepare to clean up the soil on the property, which they have owned more than 20 years. Edison will also assist the city in creating a public park east of the High Line to 10th Avenue between 17th and 18th Streets, “like the Spanish Steps” in Rome, said Ken Miller, an Edison executive vice president. Developers who have owned their properties for less time, perhaps even those that bought at the top of the boom, may not have the luxury of waiting out the market. Citibank has been trying to sell a slightly cantilevered shiny metal-skinned condominium building at 245 10th Avenue and 25th Street, said Erik Ekstein, the owner of Ekstein Development, who said he was asked if he wanted to take over the project. He declined. Mr. Ekstein is developing a 91-unit condominium building at 540 West 28th Street and a 30-unit rental building at 537 West 27th Street, midway between the High Line and 11th Avenue, along with L&M Development Partners, a firm based in Westchester County that typically develops low- and moderate-priced housing. The projects will not be built as affordable housing, because two years ago, L&M couldn’t buy enough development rights from landowners immediately beneath the High Line to make moderate-priced units feasible, said Ron Moelis, a principal with L&M. “People were valuing those development rights so high, they priced themselves out of the market,” Mr. Moelis said. Since the economic downturn, “there are maybe some people who need some money or liquidity, so more development rights have come on the market the past year or so,” a boon to property developers. Some developers have been able to exploit distressed situations. Equity Residential of Chicago announced at an earnings meeting earlier this year that it was leasing a parcel at 23rd Street and 10th Avenue, where the previous developer had poured a foundation before running into financial trouble. Equity plans to build 111 apartments and 9,400 square feet of retail space, and construction has already started. Another parcel at 500 West 21st Street and 10th Avenue changed hands in May after its owners group, including the developers Charles Blaichman and André Balazs, defaulted on the loan. Sherwood Equities, a real estate development and investment firm based in New York, picked up the property, which has a 19,000-square-foot garage on it, for a fraction of the $50 million the original owners paid in 2007, said Ryan Nelson, a Sherwood senior vice president. In July, Sherwood leased the site to a garage operator. Later, when construction financing and loans for homebuyers become easier to obtain, the development company could build 100,000 square feet of residential, hotel, office or retail space, said Jeffrey Katz, Sherwood’s chief executive. A hotel planned for 511 West 21st Street, abutting the High Line, with backers who included Mr. Blaichman and the rap musician Jay-Z, has been reported to be another casualty of the economic downtown. Another property on the market is 508 West 20th Street, which abuts the High Line on the west side. No buyer has yet stepped up to pay the $9 million asking price for the 3,800-square-foot lot, a broker at Zohar Properties said. At the height of the market, the price of properties next to the High Line may have soared as high as $400 a buildable square foot, but current prices are roughly $200 a buildable square foot, said Paul Pariser, a co-chief executive of a commercial property owner,Taconic Investment Partners, based in New York. In 2008, Taconic, along with the Related Companies, one of the city’s most prolific developers, opened the first condominium building with access to the High Line. Now, Taconic has almost completed 15 Little West 12th Street, an 80,000-square-foot office building with retail space east of the High Line. Taconic is also poised to develop another office building at 837 Washington Street at 13th Street, also east of the High Line. “The High Line has been a very positive influence to push activities to Washington, which was sort of a back street, but now it’s become very prime,” Mr. Pariser said. Mr. Pariser said a new office building, the High Line Building at 450 West 14th Street, which is still being completed, has been quickly attracting tenants. A gas station at the corner of 10th Avenue and 14th Street, abutting the High Line, is available for lease, said Karen Bellantoni, an executive vice president with Robert K. Futterman & Associates, a retail real estate brokerage firm. She said that future development along the High Line north of 18th Street would be mostly residential. “My understanding is that there are a few things in play, but right now, everyone’s sort of waiting to see,” Ms. Bellantoni said. The Related Companies — which also won the contract to develop the Hudson Yards area — has, as yet, no timeline for development of lots it has assembled both east and west of the High Line from 29th to 30th Streets, which eventually could become residential, hotel, office, retail or a mix of the four, said Bruce Beal Jr., an executive vice president with Related. “The development of the High Line so far has created a very strong submarket,” Mr. Beal said.